This is a guest post from former news editor Michael Andersen. 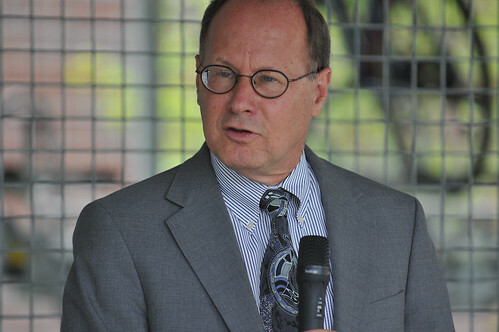 The top executive of Portland’s mass transit agency said this week that the Portland region has four top transportation priorities, and three of them are to expand capacity of urban freeways. TriMet’s Neil McFarlane has inexplicably assumed the role of freeway expansion advocate. Why is the head of a transit agency actively promoting freeway expansion projects? The fourth project, McFarlane said, is a proposed light-rail line through Southwest Portland into Tigard and Tualatin, along either Barbur Boulevard or Interstate 5. McFarlane’s words come as the state legislature is, for the second time in three years, meeting behind closed doors in an attempt to strike a late-breaking grand bargain that would increase the state’s transportation taxes and spending. A similar 2015 attempt collapsed at the last minute amid false claims by Gov. Brown’s administration that the state could reduce carbon emissions by widening its freeways. Let’s ask: does Portland even need to be “fixed”? Let’s also leave aside, for a moment, the suggestion (also endorsed by failed Republican gubernatorial candidate Bud Pierce) that the next lane added to various Portland freeways will be the one that never fills up. Instead let’s ask: does Portland even need to be “fixed”? 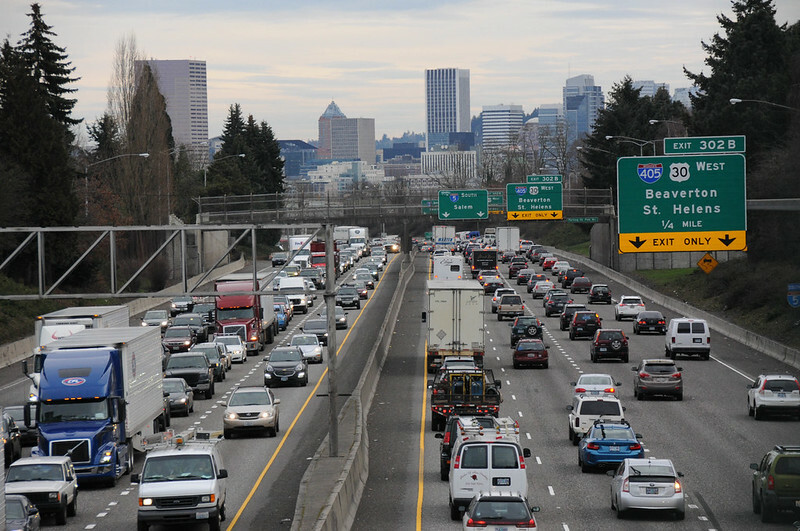 Coming from Courtney, the implication is that Portland’s transportation situation is uniquely problematic, a statewide concern because its traffic congestion is a burden on the state’s economy. It’s certainly true that the Portland region is light on freeways. We have fewer lane-miles of freeway per resident than all but four U.S. metro areas. And it’s true that cars and trucks often get backed up on our freeways, especially since the local economy started roaring back from the Great Recession to become the fastest-growing regional economy in the country, creating 71,000 jobs in eight years and driving the unemployment rate to 3.4 percent in the midst of a population boom. I-5 just north of the Rose Quarter — a section of freeway ODOT has wanted to expand for many years. Here’s a spreadsheet with all the data in this post, which is from the most recent year available online, usually 2015. 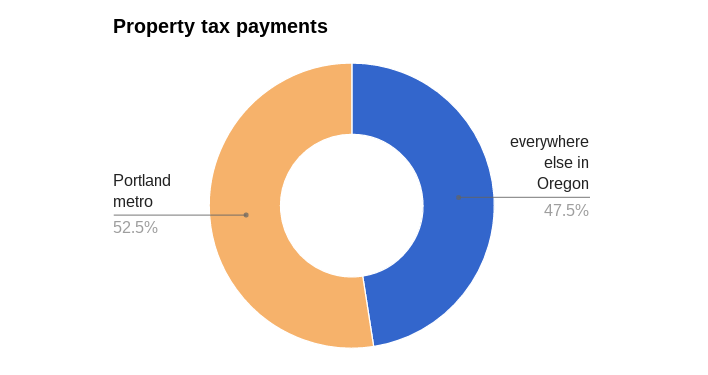 And let’s compare that to the taxes the state collects from the Portland metro area. So despite their rush-hour struggles with congestion, Portland-area residents are unusually productive for the state. But what about Portland’s very visible poverty (another frequent complaint of the Portland Business Alliance, as it happens)? Is it a drain on taxpayers? It’s hard to answer this question precisely, but let’s make an estimate by considering the location of Oregonians who receive food stamp benefits. What about the country’s other three biggest social programs, Social Security, Medicare and Medicaid? OK, now let’s stop focusing on all these costs of a civilized society, and check some things we know are good. For example, there is no more reliable predictor of future economic growth than education. 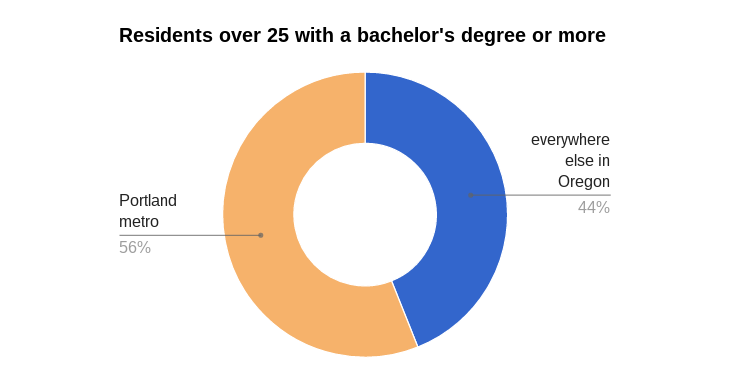 So where do Oregon’s college graduates live? Every picture tells the same story: The freeway-poor Portland area is not only a non-burden on the state economy. It is the main force driving the state economy. The Portland region is out in front of the rest of the state’s economy and much of the rest of the state is drafting off it. 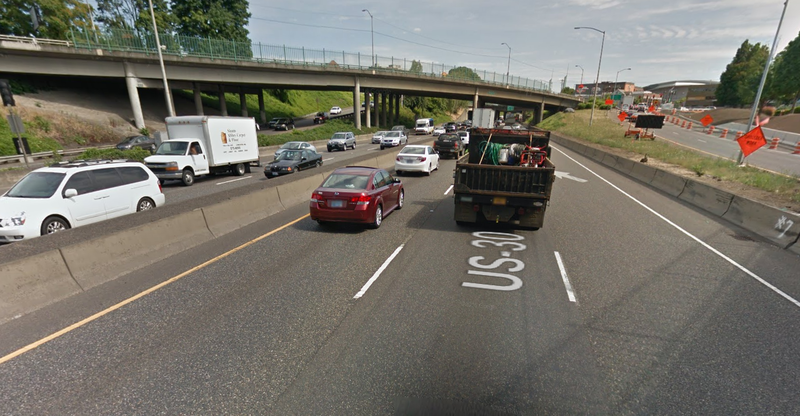 Here is a different Google Street View of Interstate 5. This one is from Woodburn, a city in Sen. Courtney’s district. Food benefit usage is 56 percent higher than in the Portland metro, median incomes are 26 percent lower and bachelor’s degrees are 63 percent less common. 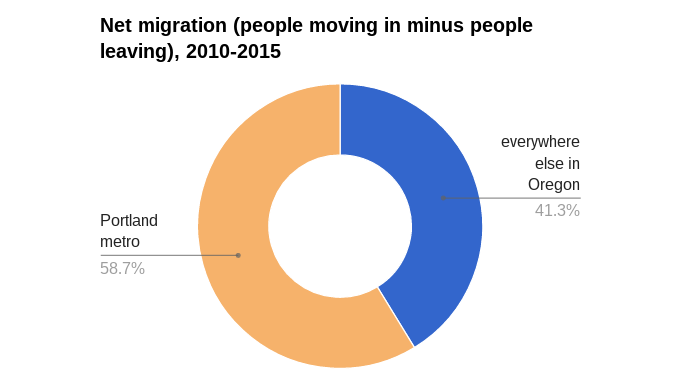 Since 2010, the city has added 641 additional residents. But freeway traffic is pretty light! Is the point of all this that cities outside the Portland area are bad or worthless? Absolutely not — there’s a lot more to life than money. 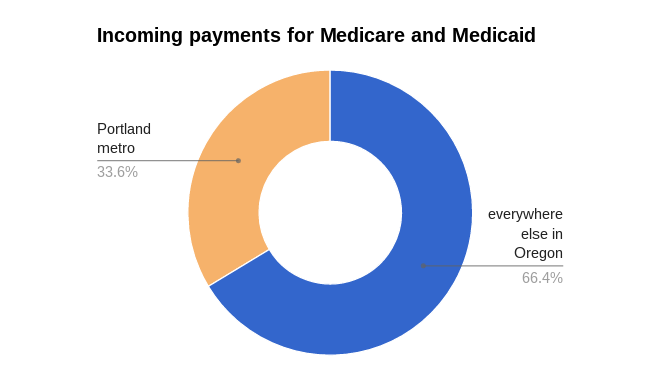 Is the point that Portlanders shouldn’t be paying more than they receive in public services? Not at all, and in fact Portland-area residents tend to be enthusiastic about all the services listed above. Generally speaking, all they ask is to be allowed to continue their disproportionate funding of public services, which improve the state and country for everyone. The point of all this is that traffic congestion is not a cause of economic collapse. It is an effect of economic success. In fact, the choices that lead to congestion — a relatively compact urban area that hasn’t been sliced up by freeways, and has spent its money on things like mass transit and libraries and parks and restaurants instead — might actually be a cause of economic success. It is true that the Portland area’s auto congestion is annoying. But attempting to “fix” it — at least in the way that Courtney and apparently TriMet are urging us to — is the last thing Oregon’s economy needs. It’s worth wondering whether your state legislators have been hearing that from anyone. Thanks to Charlie Tso for calling attention to the Tribune piece. I’m glad you wrote this Michael! Thank you. I’ve been fuming about this and related issues for a while now and as often is the case when I’m so disturbed by an issue/story it’s sometimes hard for me to put a cogent story together. – Why the hell is Neil McFarlane carrying ODOT’s water on these projects? Doesn’t he realize that the reason TriMet ridership numbers are not carrying their weight in our region is because driving continues to be easier and more convenient than taking MAX or the bus for way too many trips. Could it be that ODOT knows very well that adding freeway capacity in central Portland (and other urban areas) is likely to be controversial so they put forward “the transit guy” to help deflect the anger? Could it be because TriMet is willing to do anything for money so they can build more mega-projects instead of investing in existing buses and light rail to make them more convenient, efficient, and reliable? (Recall that TriMet was happy to see the CRC go forward as long as they got a MAX extension to go along with it). – It’s 2017 and pretty much our entire legislature is going along with the “We need to fix Portland congestion by adding freeway capacity” mantra as if it’s 1975 all over again. Yes, even the Democrats. If ODOT thinks they’re going to widen I-5 through central Portland they need to make a better case than the juvenile “It’ll fix congestion” (their current argument is that another lane will decrease rear-end collisions — something more attentive driving and slower speeds can do for much cheaper)… AND if this project goes through it will only be because ODOT and PBOT can guarantee the public that just as much money (or more) in the project will be spent to vastly improve bicycling and walking and transit infrastructure in the immediate area (lord knows we need it). The congestion issue in Portland exists because driving competes with other modes far too well. We’ve made it too cheap and too convenient – while we’ve knee-capped and starved other options like biking and transit that should be a more desirable option. The idea that we’re going to throw MORE money at driving capacity in 2017 in the Portland region is ridiculous bordering on absurd. All this being said, I’m not reflexively always against every freeway project. I just have no reason to trust ODOT or TriMet to do the right thing. Democrats are just Republicans who are lying to, and abusing the deeply held beliefs of a different base. I think you’ll find that they all have custom suits made with large pockets to accept lobby cash, and that their behaviors are accordingly, quite similar. Yep, the Democrats are equally as corrupt as the Republicans; they are just less racist/sexist/etc. Perhaps you’d think differently had you grown up in the poster child city for Democratic corruption. You misunderstood. I do not believe Democrats more saintly or less susceptible to temptation than their Republican counterparts… I was expressing contempt for the idea of branding a whole group of people as being sexist and racist because you disagree with them politically. Scapegoating and guilt by association is no more palatable when done by those on the left than those on the right. I’m not branding an entire group, I am stating that the GOP platform is based on hate. As I have explained to you many times before, stating that the Republican Party is racist is not the same thing as saying literally all members of that group hold those beliefs. I mean FFS, you have a party supporting a presidont that literally started his campaign with a racist campaign against President Obama. Every GOP holding office that is supporting our current presidont is as at a minimum okay with racism to get their unpopular agenda passed. This is their platform. I don’t agree with most of it, but I do agree with some. It doesn’t appear to be “based on hate”. For once, I agree with Adam. One of my internships after grad school was in the City of Chicago Dept of Environment Not long after my year was up, several of the inspectors all got charged with accepting bribes. There was more nepotism and favoritism in City of Chicago hiring than I have ever seen elsewhere. It was simply a cultural thing and accepted as normal. I think he was referring to the misguided idea promoted by some (I never heard it from you) that there was no real difference between Democrats and Republicans, so it didn’t matter who you voted for, or whether you voted at all. The election was really very close, and that attitude may well have tipped the balance toward Trump. Who knows how close it was. The way I hear it, there was rampant “voter fraud” that we haven’t investigated yet. And Russian interference that the Republicans don’t want to investigate. I voted Democrat in the 2016 election, thank you very much. However, I’m talking strictly in terms of corruption, here. I don’t have the fear that the Democratic Party is going to destroy America, like I do with the GOP. That is because their propaganda is aimed at you, Adam. The Democrats, and stuff that resonates with you in general. Be extra cautious with your trust in such statements. Because they are lies directed at you! Doesn’t he realize that the reason TriMet ridership numbers are not carrying their weight in our region is because taking MAX or the bus continues to be more difficult and less convenient than driving for way too many trips. In other words, I think the onus is on TriMet to up their game, rather than degrading other modes to make TriMet look better by comparison. I mostly rely on cycling to get around, but I do use the bus a few times a week. The bus system in Portland leaves a lot to be desired, especially if you need to transfer. (Who the hell decided that “frequent service” means every 15 minutes, anyway?!) I am dedicated to my car-free lifestyle, but TriMet does not make things easy, and there really is no incentive in Portland to go car-free unless you really really want to. Saving a boatload of money is an incentive for some. Saving time is important for others! Why not both? 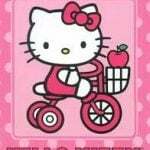 Ride a bicycle. Yeah–I’d like to see TriMet double down on Transit, just make some bus line somewhere really work, put some sweat into it and see what it would take. A little success is contagious. Instead we get the Head-Of up there shilling for more freeways. What a load. Also, the Steel Bridge. The failure prone bit that’s going to bring the whole system down. Could we just pre-emptively split Max in two and put a fancy pedestrian / people mover bridge between the Rose Quarter and a landing in NW, maybe in the PO blocks? I’m sort of OK with a tunnel, like other commentors I regret the stupid short-trains-bumping-through-red-lights thing, as well as having tracks in so many surface streets. Trains on the same street with cars? Nuts. It means lousy signal cycles for both. The Steel Bridge is (still) UPRR. They’ve offered to sell it many times, but no one wants to buy and maintain it. TriMet can’t even handle a simple BRT project without giving into car interests to the point of absurdity. Not removing two vehicle lanes from Powell or 82nd is an “absurdity”? TriMet is calling the project Bus Rapid Transit, but there will be nothing rapid about it – it is operating entirely in mixed traffic. They couldn’t even find room for bus lanes on Outer Division, which has seven lanes dedicated to moving and storing motor vehicles. The line was shortened from ending at Mt Hood CC to Gresham TC. And there is a good chance that the bus will not even use our brand new transit bridge, since it is unlikely TriMet will spend the money on a viaduct over the UPRR tracks. What we are getting instead, is an express service with longer buses, something that should not take three more years to develop. Oh, I agree that their project is pretty thin gruel. But the alternative you support involves removing vehicle lanes from some pretty major thoroughfares. Without taking a position on that decision, I cannot find any justification for calling it “absurd”. Could explain why there was no rational reason for deciding as they did? Is is absurd that Metro/TriMet/ODOT would rather propose condemning and demolishing property along 82nd and taking park space away along Powell before they could even think of taking even an inch away from cars. They could have even likely found room on 50th if parking was removed. I find the idea that we are unwilling to reallocate space from motor vehicles absurd. We are willing to do exactly that (it’s what we did on Division, for example, or Clinton which once carried as many vehicles as a pre-reconfigured Division, or any number of other streets). TriMet/PBOT is apparently not willing to do that on major arteries (other than Division and Foster). They have good reasons (including the impossibility of getting ODOT, who owns those facilities, to agree), and even if you would weigh the tradeoffs differently, you can’t say that all the factors favor your preferred outcome. Their position is not absurd. I feel like we are living in Jurassic Park. Everywhere you look: Trimet, ODOT, PBA there are dinosaurs. I agree that’s a big part of what’s going on. The region/state is changing and these organizations are not keeping up. That’s the problem with special interest groups and big inefficient bureaucracies —— they are very good at maintaining a status quo, but not good at reacting to a new reality. Look at ODOT… They’re struggling on several levels: Their credibility and governance model is being deeply questioned by the OTC, lawmakers, and outside experts; they are way behind-the-times on safety as evident by their stance on Vision Zero (it’s flourishing in cities while they are reluctant to embrace/meld it into their work); and here with projects.. they are still pushing highways first while other modes clearly offer better ROI and more popular with the public. Shameful. Even Highway 217 was turned from a boulevard to a freeway and it led to the demolition of homes in the Metzger neighborhood. I could not agree more, but man it sure is frustrating to try to get anywhere if you “need” to use I-5 in NoPo. That’s the thing Steve… We should design our system so that the people who “need” the resource the most have the most ease in using it. There’s plenty of room on I-5 through Portland if it served just “need” trips. The problem is, people expect it to be free-flowing for choice trips of all kinds 24/7. The reality is that much of the political inertia for widening I-5 in Portland isn’t just about paternalistic b.s. 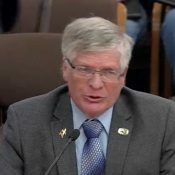 about “fixing Portland’s problem”… It’s about lawmakers who are frustated that people can’t DRIVE THROUGH Portland with more ease. It’s just like the CRC… the congestion isn’t even driven by Oregonians. Much of it is through traffic headed to Washington and points beyond. I’m happy to host visitors in our city and make sure they have reliable transport — but not at such a great cost to my fellow Portlanders (and Oregonians). A mean email? Over what you (very politely) said, there? Gah! 🙁 And grrrr! I “need” to get home twice a week from south of Portland to North Portland, by driving I-5, to 405, to 30. The traffic is miserable on the freeway portion during peak hours. Last night, like each and every time, I planned my trip to travel that stretch at 7 pm, leaving work later than I really should. Like almost every time, traffic was free flowing. It makes for a late dinner with family and often means I miss seeing my child before bed–alas, not ideal, but I’ll survive. I mention this anecdote because I question the supposed “need’ of many of those vehicles’ drivers, and think there are far better ways to alleviate the problem than bulldozing more neighborhoods and adding more pollution. Imagine what I-5 would be like if there was light rail service to Vancouver, and a $2.50 toll on the bridges across the Columbia. You might have an easier time getting where you need to go. Until, at least, induced demand absorbs the freed capacity. I think they need to extend carpool/transit lanes to the Rose Quarter on I-5 and get busy rebuilding the rail bridge to reduce bridge lifts and allow an extension of the yellow line to Vancouver. This reminds me of the collapse of the Mayan civilization. When their advanced culture and economy began to fail because of poor agricultural practices and soil depletion, they doubled down on what they thought was important by building more pyramids and conducting more human sacrifices. Todays freeways are our pyramids and the deaths of motorists, cyclists and pedestrians are our sacrifices. Good analogy! See also statues on Easter Island, Greenland Vikings refusing to eat fish and white American southeasterners missing industrialization because they wouldn’t end slavery. Thanks for the great article Michael. Your analogy of the Greenland Vikings is even better than the Mayans. One historian remarked that the Greenland Vikings failed because they could not imagine seeing themselves as anything but europeans ( motorists) who could only raise cattle, sheep and goats ( drive cars) even though they had the example of the inuits ( cyclists) who thrived by fishing and hunting seals,( riding bikes). That historian was Jared Diamond. He also noted that the Inuit were much more skilled at cycling across the tundra which gave them an clear advantage in the chariot wars that arose from the competition for the last remaining supplies of gasoline left after supply lines to Greenland were cut. The Vikings, left without fuel for their cars, slowly starved. I too have read Jarad Diamond, a very good writer but not a very good scholar. Apparently the Greenland Vikings were the only Vikings that didn’t eat fish. What he later wrote was that there were long periods, decades often, when the fish and whales wouldn’t enter their usual fishing grounds – ocean deserts, so to speak. The problem wasn’t a lack of bicycles or their use, but a lack of parts that held up to the salty sea air. Cheap imports from Japan dried up and even cheap J&B specials were hard to come by. In addition, Norwegian tradesmen, presumably carrying refined North Sea gasoline, would stop by their harbors until the 1400s, to trade for furs and old car parts. It probably didn’t help that Amazon stopped shipping to Greenland after losing too many of their ships to winter storms. And if you had ever eaten hakarl, you’d probably swear off fish as well. I (and Jared) stand corrected. But I do enjoy HK’s analogy as well. They would have survived if they used Brawndo on their crops. Today’s corn is our corn depleting the soil nutrients and I don’t know where the high fructose corn syrup fits in with the Mayans. Great argument regarding Portland’s healthy economy, but I think the more pertinent line of inquiry is whether these people have ever spoken to a traffic engineer. “Curing congestion by adding lanes is like curing obesity by loosening your belt” is such a cliché by now that I’m almost embarrassed to repeat it here, but apparently there are people who think about transportation all day who have still never heard of latent capacity. Even if congestion were strangling the city—and again, excellent demonstration that it’s not—fatter freeways would just strangle it with a slightly thicker rope, and everyone who studies this stuff has known it for decades. Sheesh. Not to mention that we already cannot afford the infrastructure we have, building more/making it larger is not going to help. Investing in mass transit has a much better return on investment, and bike/ped infrastructure is an even better deal! Adding lanes to relieve traffic is analguous to loosening ones belt to lose weight. If it was possible to build your way out of congestion, it surely would have been done successfully somewhere by now. – Extending the yellow line into Vancouver, whether that is part of a CRC-type project, or a standalone one that provides a local access bridge, or expands heavy rail capacity at the same time (for Amtrak Cascades and commuter rail). – Light rail on Powell to I-205, and Division to Gresham: a project that would see huge ridership and greatly increase the MAX system’s flexibility and ability to handle disruptions at the Steel Bridge. – A solution for the Steel Bridge, whether that is a new bridge or a LRT tunnel through downtown. Elon Musk is boring. Literally. I do not believe Elon Musk is the visionary people make him out to be. History will remember him in the same way they remember other Futurists like Le Corbusier or Robert Moses. Be wary of anyone who claims that the solution to all of society’s problems is more technology. Time will tell, but he’s certainly putting his money where is mouth is. I don’t think building tunnels in an area waiting on a huge earthquake is a good idea. Japan is full of tunnels. And they know a thing or two about earthquakes. If SW corridor is so important, why aren’t they running twice as much bus service down Barbur and pushing to convert a lane of I5 from Tigard to bus/carpool only? Why aren’t they doing things they could do, right now, to meet the demand? If Powell needs rail, why doesn’t it have BRT (or nearly that level of service) already? Because for BRT to be useful and effective, it needs a dedicated ROW. Removing a general purpose lane on Powell is not going to happen. Rapid Transit on Powell would need to run elevated from 17th to at least 39th. By the time you build an elevated concrete structure, you might as well run LRT so you can tie in with the LRT line on I-205. This would allow Trimet to route the green line from Clackamas to downtown via Powell and the Tillicum, reducing the congestion on the Steel Bridge. I think the statistics cited here just tend to suggest that the cost of living in Portland has gotten so high that people who don’t have well-paying jobs (including those on benefits, homeless, etc.) have been forced outside the metro area. That’s a whole ‘nother discussion that to my mind doesn’t prove or disprove the statement about freeways. Personally, I’d like to see no money spent on expanded freeway capacity, or some kind of tie between transit funding and road building such that for every $1 for roadbuilding, another $1 (or, since this is my personal fantasy, $2) gets spent on transit. Can you imagine the amazing transit system we could have given that budget? Slight tangent, but I would love to see the graph of ROI/enhanced utility as freeway capacity iincreases through / around a metro area. I have to believe that the Vancouver BC approach (no freeway through town, everyone exits the freeway onto local streets) is not optimal, but adding a 5th lane when there are already 4 also has sharply diminished returns. How would you even get at that kind of information? Vancouver BC metro-area has a freeway bypass around the city, along its east side, which could easily happen in Portland too. There was a serious proposal already for a Troutdale-Camas freeway bridge, to bypass Portland. Vancouver BC also does not have a single highway within the city proper. I’d rather see central Portland highway torn out rather than building a third ring highway around the metro region. Technically, it does, in its far northeastern corner, just as it starts to cross the Burrard Inlet, but I see your point and I agree, Portland would be better off on the long run without huge freeways, but with Parisian-style boulevards and tree-lined avenues instead, lined with dense buildings like any solid European city. The new Bay Bridge is now the widest highway bridge in the world. It’s not just freeways that full. Look at how packed the MAX is during rush hour periods for example. I’ve seen the same thing with buses. Imagine if during peak times Trimet doubled capacity across the system (Bus, Rail, even the capacity of park and ride lots) from current. I have to imagine this would attract many more to transit by being more frequent (people hate to wait), not being squeezed tight/not being able to sit, create more space for people to bring bikes on board to complete their trips, etc…..
We can’t double capacity, because TriMet chose to go the cheap at-grade route rather than building quality grade-separated rail as Sound Transit is doing in Seattle. MAX is pretty much at capacity during peak hours due to our small block sizes. Adam H, couldn’t Trimet invest in more carts and double the frequency at rush hour? Same size trains, double the capacity? Not really without completely blocking some intersections for cars. Lets take the worst case location, the Rose Quarter Transit center to the Steel bridge section. There are 4 different lines passing through the area, with one train for each line in each direction every 15 minutes. That means for both directions you have a train going through the intersection every 1 minutes 52 seconds (15 minutes each line/4 lines/2 directions=1:52). You double the frequency, that means a train is passing through every 56 seconds. You would grid lock that intersection to cars. The only real solution is to grade separate, either by going above the roads, or tunneling. Infrastructure is an issue, including its costs and maintenance. But with transit, unless its automated (driven by robots), the real issue for TriMet is the costs of more drivers, supervisors, health plans, pensions, etc. Expand all you want, but how are you paying for it? You and ODOT still have that issue to resolve. TriMet already has signal priority. Unfortunately, routing all but one MAX line over a single bridge creates a choke point that hinders capacity expansion. We will need to fix the Steel Bridge. Perhaps it’s time we eliminate the outer car lanes and convert the entire bridge to rail. Or replace the bridge. The Steel Bridge doesn’t look at the in great shape. Sometime it’s OK to replace something. When I take Max to work (from Beaverton), I’m amazed at how infrequent the trains are during morning rush-hour, often 15-25 minutes apart. Good article. I still drive because Trimet is so slow. And before anyone says I should live closer to work. My wife’s commute is not only 1 mile as our home is very close to her workplace. When I lived in Tigard I could bike to work in Hillsboro in the same amount of time (if not a little quicker) that it took to use trimet for the same distance. I stopped splitting my commute (bike and max) once the fares started to increase ($1.35 beaverton to hillsboro was worth it, $2.50 isn’t). Now I live in Milwaukie, and while I haven’t tried Trimet for the commute yet, the Trimet site gives an 75 minute triptime for Milwaukie to Hillsboro. That’s not counting the time it takes to get to/from the stations. I can drive that distance in 60 to 70 minutes most days. So driving remains the easiest option for me, although I will switch back to bike/Trimet later this year. Either Trimet needs to become more efficient, or traffic needs to get much worse before more people will stop using their cars. I guess this is what I don’t get. If I compare an 80 minute commute by TriMet to a 60 minute commute driving, I’d take TriMet every day of the week. And I’ve literally spent years making that decision (with a 90 minute transit ride vs a car trip that could vary between 25 and 60 minutes each way). Many people obviously have a much higher threshold for driving in truly aggravating traffic than I do. And a willingness to give up that time they could spend reading, etc and letting TM do the driving. It’s obviously different if you’ve got kids you’ve got to get from day care, or some other reason why that extra few minutes of quality time vs driving time is a big disincentive, but for me the calculus isn’t close at all. I work from home, so I don’t take transit except for discretionary trips (because all my trips are technically discretionary I guess)–is Trimet predicable at rush hour? Because I can see someone opting for a predicable 60-minute drive over an unpredictable 80-minute commute that sometimes might take 70 minutes and sometimes might take 100. It’s also true – and I tried to articulate this, but maybe wasn’t clear/explicit enough – that the time comparison is not apples-to-apples. 60 minutes in my car in bumper-to-bumper traffic is not just lost, wasted time, it actively makes me miserable, makes me actually a worse person (cranky, judgmental) and I believe actually impacts my health through the stress it causes. 60 minutes on the MAX (IF I can sit down, if there aren’t other passengers acting out or other things affecting the quality of my ride), where I can read, listen to music, etc. is NOT wasted time. There were days when I worked in Gresham when the MAX ride home was one of the best parts of my day and something I actively looked forward to. Have you considered a bike/MAX commute? The ride from Milwaukie into downtown Portland is nice, especially with the new connector trail on 17th and the Tillicum bridge. You would connect to the blue line downtown. Its amazing that Tri Met is lobbying for more and wider freeways without even modest efforts at other forms of traffic abatement.The UK and skandinavian countries have been able to reduce central city traffic with demand tolls and other techniques. But it seems that discussion of anything that solves the problem but puts a crimp in easy motoring is forbidden. Someone needs to pay to send our elected officials a few books about the folly of car dependency. You can’t build your way out of congestion. You can only give people other options, something you’d think the head of TriMet would understand fully. If money is supposedly tight, why are we throwing any money at the most expensive, least effective type of transportation infrastructure? Building more highways is simply a waste of taxpayer money, as they provide no long-term benefit and only serve to increase our ever-expanding maintenance backlog. Portland does not need more expressways, we need less cars! Stop giving in to corruption and Big Oil, and start building solutions that will actually benefit the people! TriMet and Metro don’t have elected officials, right? Metro is all directly elected. The TriMet board is appointed by the Governor. What, board members can read??? But we can build our way to inexpensive housing, right? You’re right, we mostly can’t build our way to inexpensive housing, though we can build our way to housing prices not getting any worse. However, true fact: homes that share walls and/or roofs are more cost-efficient per square foot than homes that do not. So to the extent that we gradually evolve toward a Prague or Kyoto level of density (which would also be great for shortening the average trip into bikeable distance and making frequent transit economically viable!) then yeah we would probably see long-term average housing cost reduction. One useful analogy in housing is to mass transit, which gets more efficient when more people use it — unlike car transportation, which gets less efficient when more people use it. Where has the idea of creating affordability by rebuilding most of the structures in the city ever worked? The idea that we can solve our housing problems by building building building is as much a fantasy as is the idea that we can fix traffic congestion by adding lanes and driving smaller cars. We have to address the demand side of the equation as well. Like I said, the result of building enough homes for new residents (and gradually, not all at once) is not to reduce median prices but to keep them from getting worse. Once prices have inflated, the only way to get them to fall more than a bit is to wait for people to start moving away, usually because of economic decline. As discussed in the link, this process worked fairly reliably in cities until the 1920s, when we started to make it illegal to build things. Today’s median housing prices in job-rich housing-shortage cities are major historical anomalies that are blocking cross-country migration and contributing to national economic troubles. Keep in mind that housing for poor people is a somewhat separate issue that I don’t think was well executed by the pre-1920s market-take-all system. Gotta find a way to house poor folks without also driving prices way out of line for everyone else, IMO. removal of subsidy (anti-competitive subsidies are immense in the USA) and regulation can both cause housing prices to fall — sometimes very sharply. this assumes that our plutocratic captured housing “market” cannot be reformed. i personally believe that we as a city can move towards the mixed housing models used with great success from an affordability perspective in europe. When you replace one structure with two that are far more expensive, whether done gradually or rapidly, you don’t get a moderation of prices. The cost of existing stock cannot rise as quickly, and there’s no evidence that, when things finally top out, that the new stock will act as a moderating force. Yes, there may be more of it, but you are assuming a finite demand (relative to the amount of available housing) that can be satisfied. I think that is a flawed assumption. Sure. Build massive amounts of public housing. I think driver education would do more to resolve congestion than anything else. I think a significant portion of congestion is due to POOR and SELFISH DRIVING HABITS. POV: About 20 percent of drivers are causing significant congestion because they have ZERO clue how to merge and properly lane change to avoid causing congestion. We need to collectively learn to ZIPPER – at speed of traffic – from our on ramps. We need to collectively get better about lane changes and tailgating during rush hour. I’ve seen it with me own eyes, we do it every darn day some of us. I’ve become the angel of mercy every morning trying to lead by example. I merge awesome. I match the speed – if the freeway traffic is 5 mph, I go 5 mph… all the way to the end of the merge lane where traffic begins to move again. Anyone notice that traffic begins moving AT THE END OF THE MERGE LANE? Obviously not everyone because people still cut the white line, pull into a line of stopped cars, and then stop the adjacent lane because its all about them. I look back in my review and the stopped cluster I saw at the top of the ramp IS NOW MOVING. Distracted driving is also a huge factor. Fewer cars get through each green light cycle because a few drivers aren’t paying attention and leave huge gaps. Freeways are more congested because people don’t follow at an appropriate distance. If all cell phones had a “drive mode” that disabled them in cars, congestion would decrease overnight. One point to consider when mulling over the various options for moving people around… there is new technology on the not-too-distant horizon that promises to completely upend the way people traverse our city. No one has any idea what the future will look like, except that it is very likely to be different than today. Yes, and ironically doing things like building more freeway capacity just delays the change, since it reduces incentive to change. I think it is independent of the pace of change; I believe that if these new technologies work, they will be compelling for reasons not related to freeway capacity. I’m excited about the prospects for things like networked autonomous vehicles, and agree they may really revolutionize mobility in ways we can’t predict. One big problem relevant to this though: hard to see how autonomous vehicles help with the problem of rush hour. If we’re still all trying to go across town at the same time, it seems like peak demand on roads and cars will probably still create traffic jams. Other thoughts? Autonomous vehicles that communicate with one another may be able to wring additional capacity out of the existing system. Both by reducing vehicle spacing and signal wait times, as well as by reducing crashes which are a big cause of traffic backups and delay. In 10 to 20 years when a significant fraction of cars on the road are self-driving, we may see some benefit. Short of teleportation, people have been getting around the same way in urban areas for centuries – by foot or by wheel. The only game changer I can see is if we are no longer tied to the ground. 🙂 But…Gud, please, no, never–jetpacks. Ugh. The only thing that could be worse than choking ground congestion is the skies being strewn w/ exhaust-spewing, crazily darting, human-“controlled” (hah) nearly-ground-level things. I’m already pissed about drones, and at least they don’t fart out anything noxious. Or perhaps this is a savvy strategy by Neil McFarlane, a toe in the door, realizing that new highway capacity will allow the “opportunity” to add HOV or HCT Lanes or even tolling [Trumps Public + Private financing] along these corridors…assuming state/ local solons allow it. PS. Michael – does your data include the “Vancouver” population or income taxes in your “Portland Metro” numbers? 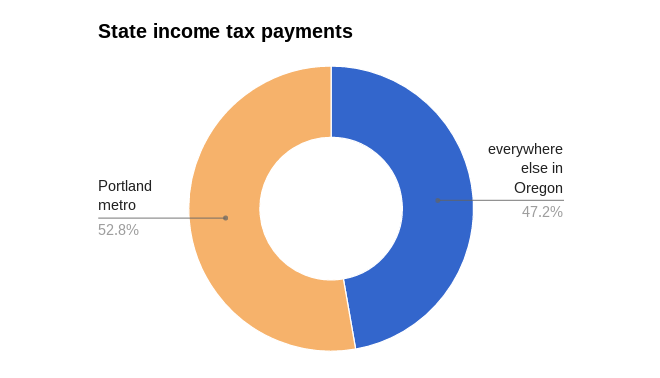 I counted Clark County as part of the metro area for income taxes (which also include other out-of-state figures in the “everywhere else” total) but not for anything else. Somebody promised McFarlane money in exchange for his statement. Whether that be odot money or some other money. He wants something…And the other groupmwsnts something. Hence….His career ending statement. And…It is career ending. Portland Oregon, the state with almost zero cat pool lanes. Why? Start there. Imagine the travel time from Portland to the couve on trimet with cat pool lanes the entire length….Even across the bridge. Or from downtown to Gresham…Down the dreaded i84. Big money and big exposure. By the way, how much bike right of way is next to that light rail Neil? Yeah, we get it. The bigger the budget, the bigger the salary. More freeway typically brings more money for light rail. Follow the money bike Portland. Just to echo some of the good comments here: this is nuts. I’m usually a pretty stalwart fan of TriMet, since I rely on it and always have going back to my first ride in 1984. I’ve always associated “living in a city” with “riding transit” but keep learning over and over again that’s not a given for other people. Now, I know McFarlane knows what “induced demand” means, and can’t explain (short of speculating on what quid might come with this quo) this goofy argument that expanding the freeway will solve anything. Traffic HAS become much worse in the last few years. It’s impacting my bus ride, which used to be maybe 20 minutes to get home to North Portland, turning it into more like 30-40 minutes. You know what’s worse than a 40 minute bus ride? Driving in heinous traffic! (I want to echo the guy who mentioned how people’s thoughtless/incompetent driving adds to the problem). The long bus ride has me on the verge of getting back to the bike commute as Plan A.
I always land in the same place when I think through these issues: sure the traffic is really bad, and I find it so intolerably bad that I’ll change my behavior in a variety of ways to avoid it. But for most people, regardless of how much they complain about it, it’s not THAT bad (yet), because they are not making different decisions, but rather continue to add their own little contribution to the problem, driving alone at the same time as everybody else. This is a great observation — traffic will continue to get worse until enough people have hit their limit, and then it will stop getting worse. Just like housing prices — they will continue to rise until people won’t pay more, and then they’ll stop. In both cases, there is effectively infinite demand, which can’t be sated by increasing supply. The situation will continue to degrade until it’s hit an equilibrium where people are no longer willing to jump in and make it worse. Actually, people move when it gets too hard or expensive. San Francisco reached its population maximum decades ago, just under a million folks. Its metro population growth rate has slowed considerably, as has NYC. Berlin reached its max in 1941 with 6 million and has shrunk since then to today’s 4.5 million. London & Paris are both shrinking. Pretty much the only places you see affluence and high growth rates are in small cities like Portland and Vancouver BC, national capitals, and small college towns, and in the developing world, of course. Oh, longed-for day! Please come! Actually…there was a house for sale near us recently that I swear, no one ever stopped to see. They changed realtors–still no action. Finally removed the sign after a coupla months. It’s (in my humble opine) aesthetically displeasing (though in good shape) and overpriced and on busy SE 26th, but…this is inner SE, just up from Clinton Theater, and such a thing was unheard of a year ago. Even less than a year. People have been snapping up utter shite on even busier roads, for waaay too much money. Is change in the wind? I wonder what’s the average threshold to push the general public to change? I have a friend of a friend that I spoke with a while back at a party about her commute—she has a 1.5 hour commute over the span of 6 miles. This sounds absurd and I’m not exactly sure where, but I know it’s over in the LO area. It’s amazing to me that she can tolerate a 3 hour round trip 5 days/week. I asked her when she’d change her habits—what will make her and her partner move and it’s when her commute regularly reaches over 2 hours one way… It’s not until she has to spend more than 4 hours a day in her car will she think about alternatives. She’s a nurse making close to six figures. I have another acquaintance where I had a similar conversation. Her partner commutes from Damascus to the Montgomery Park building with a commute time taking almost 2 hours one way. They think it’s worth it because they were able to buy a house for under 200k several years ago and have since fixed it up to their dream home. His commute when he first started several years ago took half the time. Makes me think of how blessed my partner and I are. I have a 11 min. commute by car/ 20 min. by bike. My partner has a 22 min. commute by car and about the same time for bike. Granted, we live in 606 sqft w/ two cats. We hope to buy a house someday, it’ll probably bee pretty far from our work, but hopefully not too far off the Max line. I plan on buying an ebike. Not everyone needs to change… Only enough do. Tolerance for pain is on a spectrum, and the will always be someone right on the threshold of change. I am sure many have changed their lives to avoid commutes, either by moving, changing jobs, or working from home. “Only enough do.” That’s what I’m talking about, this may take years and years to reach. What are we at for bike commuters to work, like less than 6% or something? I suspect that the stakeholders that are saying “fix portland — it’s hurting the State economy” are thinking of freight movement through the Portland area. It’s true that freight gets stuck and doesn’t have much travel time reliability and it does impact Or businesses. That said, there are other solutions and I don’t really understand why TriMet would carry water on these projects, except that their own buses are also getting stuck on our arterials. I think the only capacity solution TriMet should be carrying are for BAT lanes (bus only, or business access + transit and typically bikes). That would go a long way toward making TriMet more competitive to single-occupant driving. Yes. Great point Kate! I agree that the freight delays are getting a lot of lawmaker attention. But again (and you know this), I’m afraid lawmakers/ODOT/TriMet are arguing for the wrong “solution”. The problem for freight isn’t exactly the congestion — it’s all the private auto use getting in the way of the trucks. We need these freeways to do a better job of letting freight through while doing a worse job letting private auto trips through. Simply expanding capacity isn’t the way to do it. And all motor traffic – freight or private auto – should be paying much more to use the roads. There must be more of a disincentive to make motorized trips because they have a very disproportional and negative impact on our city/state/region/earth. We certainly agree, a better solution would be a time-based congestion charge that puts a cost on driving I-5, I-84 during peak commute hours. This would create a disincentive for those SOV trips and I suspect the freight community would be happy to pay a fee for greater travel time reliability. The trucks should be using mass transit too. How’s that? In Europe far more freight is moved by highly efficient high speed rail. Stop subsidizing wasteful and polluting trucking and start subsidizing greener and cheaper rail. Trucks need to pay far more for their freeway impact. Freeways are hugely expensive because of the literal impact of heavy trucks on them. If they were just for cars, the road beds and bridges could be much thinner/smaller, the infrastructure would last much longer and fewer people would die in accidents. It’s basic physics– Mass x Acceleration = Impact. Newton knew if an anvil and not an apple had fallen on his head, he’d be dead. Why are they sending freight during rush hours? The roads are only congested for about 1/3 of the day. 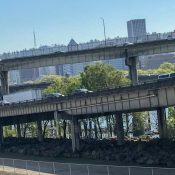 I’ve heard that compared to most cities, a high percentage of Portland’s freeway traffic, especially near downtown on both sides of the river, is very short drives. The reason is that people use the freeways as city streets, and the reason they do that is because the freeways provide the most convenient short-distance routes. For instance, a lot of Marquam and Fremont Bridge traffic is people simply crossing the river. People heading up 43/Macadam from south of downtown get on the freeway just south of downtown, then off only one or two exits later. Same thing on the eastside. It all means lots of short, local trips on freeways that really get bogged down with people constantly getting on, then switching lanes (and I’ve never seen a city with so many freeway entrances dumping people into the fast lane, so they have to get over to the slow lane to exit) and getting off a half-mile later. Mixing these short trips with people using the freeway to go from Salem to Vancouver and you have a mess. What it all means to me is that a lot of freeway traffic doesn’t NEED to use the freeway, and could be better served by better bus service or other alternatives. I could not agree with you more q. And me and my wife actually do this. We live in NoPo right off I-5 and it’s super-duper easy to drive to NW Portland via I-5 to I-405. It takes just a few minutes — compared to probably an hour on transit and 30-40 minutes on a bike. I think the first time I read about this was in the 80s or so when there was a proposal to bury the Eastbank Freeway. One argument that came up was that so much of its traffic was local that instead of burying it, you could simply remove it, and run that traffic on surface streets where it belonged. I don’t know if that was feasible, but the observation that so much freeway traffic is short-trip local traffic stayed with me. Most of my freeway use is on the short stretch northbound from the Duniway Park area to NW Portland. Total freeway time is a minute or two. The non-freeway driving route would send me down Front Avenue and snaking my way westbound through downtown streets. The freeway is by far the best option for driving, but it shouldn’t be. The Eastbank Highway is an eyesore that is taking the waterfront away from the people. It should be demolished and never replaced. It’s easier to go anywhere in your car than it is on pubic transport, unless you just happen to live by a MAX station and your destination is also by a MAX station. Come and go when you want, no waiting in weather, no stopping every block to let people on/off, no sick people coughing on you, no weirdos, etc, etc, etc, etc, etc. Convenience is the reason people use cars – same reason you and your wife do it – and length of trip has nothing to do with it – it’s easier to use the car no matter the length of the trip. PBOT had a proposal a few years back to make the I-5/I-405 belt one-way and eliminate a lot of ramps, to give it more capacity and to reduce local trips. They probably still have the plans. We need a bypass for E-W traffic and one for N-S traffic for people just passing thru the area. Should have very few exits. That would require a couple new freeways but would alleviate a lot of the congestion on the existing ones. Oh ya, a couple new freeways? No problem. Do you have $10 billion lying around? So then, if they’re dead-set on spending more on expanding the freeways, wouldn’t it make more sense to add “express” sections that bypass several exits at a time? Isn’t there areas up in Seattle like this, where if you’re just passing through you have a separate roadway you can get on to kind of get around the local congestion? Don’t know how feasible this would be, but would it be better than simply adding an additional lane? They do have that for the section of freeway going thru downtown, but only for that section; at least that’s the way it used to be. That section has gates and they allow it to be used for southbound traffic during some times of the day and northbound traffic at other times – that’s the way I remember it anyway. It worked OK, but only for a very small section of their freeway system. Can more MAX trains be added so they run more frequently? Just asking in case they are getting to be too full. I do know some of the parking lots are filled to capacity at rush hour – that’s a big incentive to drive. Driving is just a lot more convenient is what it boils down to for many people. Don’t have to be at a bus or MAX stop at a particular time, can stop on the way home for groceries, etc. And you don’t have to sit next to a coughing person who just arrived in country and hasn’t had their shots. AND many people have to stay at work until the job is done so their day ends at varying times, sometimes late at night, so the car if by far the best option in that case since at night there is little traffic so instead of a 1.5 hour bus ride you can get home in 20 minutes in the car. Do you have kids? I say you’re more likely to catch the plague from your poxy crumbgrabbers than you are commuters if you wash your hands regularly. What it boils down to is that very few people in this country are willing to walk their length. How will public transportation ever work then? Magic conveyor belts to covered bus routes w/ 1 min. lead times that drop you off in your office lazy-boy. It really is disheartening and even bizarre to see TriMet’s general manager push for freeway expansion. But part of it is probably that TriMet doesn’t have the political support from ODOT or the City of Portland to become a viable solution to congestion. No matter how nice your busses are, they can’t get through rush hour traffic without bus lanes. Good bus service needs dedicated lanes and signal priority, but it can’t get that without the assent of the road owners/managers. If TriMet had this support, the picture would be quite different. Portland might even get some bus rapid transit (BRT) like they have in Seattle now. Of course, reallocating road space away from cars is a political hot potato. But it alleviates congestion because bus lanes are more space efficient than car lanes. A great example is Dublin, where they reallocated a bunch of road space from cars to BRT (“Quality Bus Corridors” is the term there) over the last 20 years. Car drivers complained at first, but once they system was in place — giving commuters a faster way to get to work — loads of people switched from car to bus. After awhile, public opinion flipped and now BRT is there to stay. Bus lanes should be a no-brainer for TriMet and PBOT, yet they are so afraid to take space away from cars. If the entire point of bus lanes is to get people out of their cars and into better buses, then we shouldn’t care about reducing car capacity. You can fit far more people in the same amount of space if they are all on a bus vs driving alone. Imagine the cover photo with all the single occupancy vehicles removed and you’d have a roadway worth driving. Raise the price of fuel to $5.00 a gallon and you’d have a similar roadway. Then the complaint would be that our current mass transit/active transportation system is woefully inadequate. Exactly. Every time someone points out that there is too much traffic and something should be done, double the price of gas. See how bad traffic is in a week. People will just cancel their Netflix, Hulu, and Spotify. They’ll still keep their Comcast and Iphones. They’ll just cancel their gym membership they don’t use anyways. They’ll eat poorer quality fast food, i.e., McDonalds, Izzy’s and etc or turn to eating in more. They’ll allow their children to only play one sport versus two. People will find a way to pay for gas—some view it more important than food! Where, exactly, does TriMet think I-5 and 405 can expand to? I mean, a lot of the freeways in the Portland area are bounded on both sides by structures/walls/rivers/other roads. Are they envisioning a double-decker sort of arrangement? Or a tunnel arrangement for through-only traffic, so the freight can get through Portland without all those pesky other drivers? The Rose Quarter widening is an expensive beast; the other proposed expansions are on the southern stretch of 205 and on state route 217 in Tigard. The Rose Quarter widening is to extend the on/off-ramps to improve safety and operations as people enter and exit the freeway in the tight RQ area. It is widened within existing state-owned right-of-way (yes, there is space). It does require replacing the Broadway, Weidler and Vancouver over-crossings; hence the high cost. It also adds a bridge for people walking and biking only at Clackamas St. into the Moda Center area. Wait…. so it’s a safety project? Not a congestion project? You might want to tell lawmakers that. If it’s a “safety” project, let’s see the crash/injury/fatality data and then let’s compare that data to outer division or 82nd or Powell or Barbur. The Southern stretch of 205 isn’t in Portland, and neither is the Tigard-section of 217. Also, widening those areas won’t do any good unless you continue your widening spree all the way up, you’ll be cramming 3-4 lanes down to 2 at some point, with all the congestion and stand-still that implies. 217 is already three lanes in each direction at the north and south ends. Not sure what you’re talking about. Ha ha ha….’wider = safer’! Do you work for Washington County? Yes, yes, yes. We drastically need to improve our highways here. And add that SW Max line to Tigard. Our traffic is amongst the worst in the nation, and getting worse each year. Unfortunately, the entire metro area is never going to be a bunch of bike commuters. That is not a realistic aspiration. What is a realistic way to improve the highways? Most don’t have room for more lanes. It seems like the next logical step will be to condemn say a 40′ strip alongside the existing freeways, tear down the buildings and add a lane or two. Or possibly create a whole new one, which would mean condemning a swath of properties from Point A to Point B. I could also see taking some surface streets like Powell, tearing down the businesses on either side, cutting off cross traffic to limit access, and converting those to freeways, maybe with concrete sound walls to protect the neighborhoods. Boy, I don’t think you’ll find many like-minded people on this page. We’re in the midst of a housing crisis and you’re suggesting converting space for people (i.e. “tearing down the businesses on either side” of Powell) into yet more space for cars?? The city needs to keep its habitable space and make more efficient use of existing roads: expanding and speeding up public transport and demand-management measures (e.g. adjusting parking fees, introducing road-user fees, reallocating space to more sustainable modes). Expanding freeways will only attract more cars onto the grid, and and worse parking problems and congestion on secondary streets in the city center. In little to no time, the increased traffic will bog down rush hour speeds on the freeways as before (the “induced demand” problem cited above). Widening freeways is an outmoded, failed approach, as Jonathon mentions in the first comment at the top. I thought I detected a faint odor of sarcasm in q’s response. Yeah, sorry. Not you. The other q.
Oh, good. Because saying I was being sarcastic would be like saying my using “moi” was pretentious. I would never say that. The other q is a bit much, though. I could also see taking some surface streets like Powell, tearing down the businesses on either side, cutting off cross traffic to limit access, and converting those to freeways, maybe with concrete sound walls to protect the neighborhoods. What is a realistic way to improve the highways? Get rid of most of the cars. You could make each one one-way: I-5 southbound only from north of Vancouver and 205 northbound only from West Linn. Improve the highways and people will just live further and further away until the improvement has been equalized. That’s an interesting idea, but how can that be shown? Neat ideas, but there should be some support for assertions in forms of citations (or sources for data for graphs). Yeah, I’m sorry that I didn’t include citations. It was 4 am and I decided to call it good. The data is from state revenue department documents, from the federal BEA and from the Census ACS, except for food stamp user counts which are from an Oregonian database. I should admit that Courtney’s “fix Portland” language got me angry. Who is he (and who indeed are his unnamed constituents) to say that our economy is failing somehow? That’s what may have led to some of the us/them vibe you picked up. RE Economic development: I think we want steady, slow-to-moderate growth, rather than the very fast growth we’ve been experiencing over the past decade. What we have is not sustainable, and I am skeptical of projections that extrapolate our current rate out to 2040. We’re hitting limits now (housing, transportation, etc.) that will cause increasing pain in the future. That pain will impose limits on growth in the future. I believe that the only things that actually cut down on freeway congestion is tolls during peak periods. People adjust behavior when it is expensive. Road use is essentially free. You can use them whenever you want without paying any extra money. If it cost $5 to drive on I-5 from 7am to 10am and 4:00pm to 7:00pm people who could wait would and people who could not would pay. Extra lanes just allow people to live farther from work and creates more and more sprawl and traffic. By that logic, there should be no service industry in London or Stockholm? Interesting. London has 8.5 million residents and subways. I think it’s in a different league than lil’ o’l Portland. A cautionary tale: Los Angeles just spent one billion dollars adding a single lane to a 10-mile stretch of “The 405.” Travel times did not improve. Induced demand is well understood by readers of this blog, but some people may never get it. It may be more useful to ask, “Do we want our beautiful city to look more like Los Angeles, Huston, or Atlanta?” If so, we better start widening freeways. The widening of 217 is project that needs to happen. It’s already been completed at the very north and south ends. Unfortunately with the way the streets in area have been laid out, there are few good north/south alternative roads to take the burden off. The other issue is that if the red line had been extended down the side of 217 to Tigard and Tualatin (replacing WES), we would have a transit alternative but with Trimet ignoring this option and admitting that WES can’t be fixed with more stations, frequency and operating hours, there is no other option but to add freeway capacity. Many of you may hate freeways but this thing already exists and there are few alternatives available to it. And what are those in the 217 corridor? Trimet cannot/willnot expand WES. They also would rather build the SW Corridor project than do the much cheaper option of expanding the Red Lin down along 217 to Tigard/Tualatin. During rush hour the oddly laid out roads in the area are in gridlock. I’m excited to hear your options? Replace TriMet? Move somewhere else? Work from home? Get another job? Your premise is that nothing can be changed but the width of a highway. There are NO alternatives? Just because you and many others are demanding a magical never-filling conveyor belt from one city to another for your daily commute does not mean that it needs to bought for you. The world will still rotate without an additional freeway lane. “Replace TriMet?”Why would another government agency do better? What are you proposing? “Move somewhere else?” Do I have another other options than Downtown Portland? Come on man, telling people to move is just something you through out there to rile people up. “Work from home?” Most employers don’t give you that option. “Your premise is that nothing can be changed but the width of a highway. There are NO alternatives?” Nothing realistic is coming from you. You may hate widening the freeway but come visit me on the westside and tell me how we resolute the dumbA network of streets that prevent you from driving straight-thru and the crappy bus service and the idiotic WES service. david–you told Dan A, “Nothing realistic is coming from you”, yet ALL his suggestions are realistic for some people. But you really kill your argument for freeway widening by calling the bus service “crappy” and WES service “idiotic”. You just named two options for improvement that don’t involve freeway widening right there. There are also other ones he didn’t mention—for instance, employers allowing flexible hours, so employees can avoid rush hour one or both directions, even if only for a day per week. Or, an employee may not be able to work at home every day, but working at home one day per month, or even just a morning or two (so you can avoid rush hour) will reduce traffic. And the main thing–NONE of these have to work for YOU in order to make your drive better. They only have to work for some people. That frees up lane space for people who really don’t have other options. q – bus service in the western suburbs of Portland is crappy. Many areas are not served. Those that are served have infrequent service. The Barbur bus used to be a one seat from downtown to King City, now you have to transfer, killing ridership. The list goes on and on. And WES in it’s current formation is idiotic. It was a dream of a Washington County commissioner who thought he was smart enough to build a cheaper light rail line. The corridor is solid. It is a nice quick trip. But it has too few stations, runs too infrequently and only during the rush hour. You can’t expand service and it costs $12-14 to provide each ride. If that’s not idiotic, then I’m not sure what it? david–you might want to reread what I wrote. I didn’t say you were wrong in calling the the services crappy and idiotic. I pointed out that if they ARE crappy and idiotic as you claim, then it makes sense to try to improve them before going straight to widening freeways. 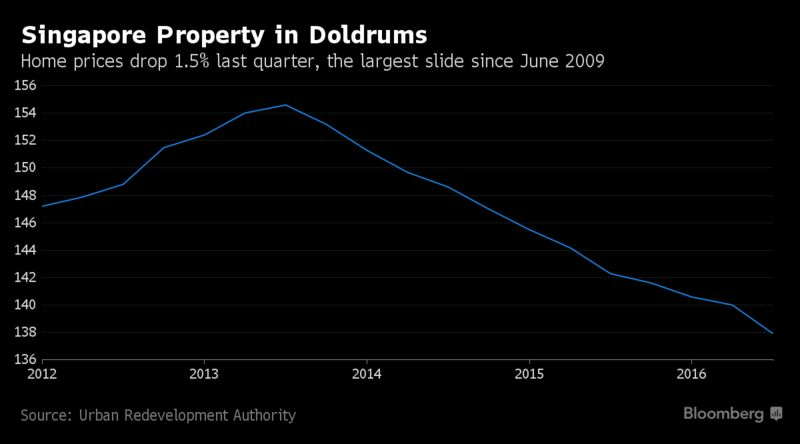 …And Europeans just keep building more of them. Even the Dutch do. There’s nothing wrong with WES that couldn’t be fixed by more frequent service. It links together a bunch of important westside transit centers. It’s a great ride – faster than MAX (or the #76 and #78 routes that parallel WES, for that matter), and more convenient. The problem with WES is that it only runs during weekday rush hours. TriMet’s not running WES more often because there isn’t enough (declining) ridership. Or is ridership low because it doesn’t run often enough? Trimet can’t add additional service since they don’t own the trackway and the railroad won’t let then add more service. However, there’s plenty of room along side of it to add two tracks for light rail along much of it’s route. There also needs to be additional stations and a fly over to Washington Square. Dave is right. WES is insanely expensive to operate due to the equipment, FRA requirement for two operators, and ROW restrictions. Extending the red line at least to Tigard or Bridgeport (with a flyover to Washington Square) is what this corridor needs. Trimet will do it if Washington County makes it a priority. Light rail requires overhead wires to supply electric power. Lots of money required to do that, so instead, we have the stinky, noisy diesel motive units, whose beauty is in the fact that they don’t need those wires to travel. More interurban trains though might be a better way to accommodate the increasing travel needs of a growing population than can ideas about increasing freeway capacity. Freeway capacity increase enthusiasts can hope and wish all they want, but that can’t change the simple, physical limitations freeway expansion is bound by. To relieve congestion, supposedly, and accommodate anticipated future population growth, how much wider will the existing freeway widths need to be? Can anyone realistically visualize doubling or tripling the widths of major freeways in the Portland Metro area? Elsewhere in this discussion, reader Kristen brings up the idea of decking existing freeway widths in order to increase capacity; two or three stories high for example. As wacky as the idea sounds, in the crazy pursuit of increased freeway capacity, it wouldn’t surprise me too much if someone suggests exploring such an idea. There’s no easy answer. Eastern cities with big rail lines and service, have huge rail right of ways and rail yards. Portland’s Union Station at one time, had quite a big rail yard, until not so long ago, someone figured out it wouldn’t be needed any longer. WES with its diesel motive units (DMU’s), got built rather than another light rail line, because of the two, it was by far the lowest cost option to build. I’ve read that people that ride WES, like it, and I’m glad they do. The dmu’s on their heavy rail, crossing over the two major highways coursing through Beaverton, causes a huge slow down in traffic flow on those roads. Bear in mind, because they serve a lot of through destinations, traffic on those roads represent far more than just local Beaverton traffic; in other words, Canyon, Beav-Hillsdale Hwy-Farmington, are region serving highways. It seems to me that congestion on I-5 through Downtown Portland, is and has for many years been due primarily to the am/pm commute, a consequence of an excess of laissez-faire planning. To this day, there still appears to be a lot of reluctance to plan communities upon concepts other than by what the market demands. One of the negative consequences of this type of planning, is the daily am/pm long distance city to city commutes people make in great numbers that jam up the freeways. Hwy 217 through Beaverton, has this problem. Hwy 26 out to Hillsboro has acquired the problem too, more recently. Local leaders talk about building freeways expansions that can resolve the congestion problems…and it seems some people are relieved to hear them talk this idea up. Personally, with anticipated population growth in mind, I doubt that widening freeways to try resolve am/pm traffic congestion will ever be successful. True, WES does disrupt traffic pretty significantly in downtown Beaverton, but a Red Line extension would create exactly the same disruption each time a train had to come through. I wasn’t aware of all the restrictions against WES expansion, and am intrigued by the idea of a Red Line extension. But I still think SW Corridor rapid transit should be a higher priority. That said, I’m not clear on how light rail got to be the preferred option. I’d expect BRT to be a much more cost-effective option, and would raise less objection from the transit haters in those communities. I’m pretty impressed with the recent BRT implementations I’ve seen (at least in Minneapolis and Seattle, maybe less so in Calgary). In Minneapolis we now have both kinds of BRT: the traditional type (known as the Red Line), which despite low ridership – due to serving a very low density suburban area not well suited to mass transit – functions very well. Presumably the SW Line would be more of this style if the BRT option were selected. I still think it’s an excellent alternative to light rail. We also have aBRT (arterial BRT), which stops more often and isn’t quite as fast, but is still 20-40% faster than conventional local bus service. aBRT is often derided as “BRT-lite” but it still has many of the features of traditional “heavy” BRT and is still a massive improvement over traditional bus routes – and it costs a fraction as much as heavy BRT to develop. Our A Line, as it’s known is blowing away ridership projections and a smashing success. Because of the reduced cost and planning required compared to traditional BRT, we’re going to be able to roll out a new aBRT line at more or less the rate of one per year going forward. This is the style of BRT that TriMet is planning for Division Street. Come to think of it, maybe the way to alleviate WES’ expansion limitations is to bring aBRT to that corridor, i.e., the existing Routes 76/78 that parallel it. Hopefully TriMet will be able to roll out a series of aBRT routes over the coming years, perhaps with the Hall/217 corridor next in line after Division. About the south end, I can’t say for sure, but the north end where 217 passes under 26 and intersects with traffic from Barnes Rd, and enables traffic to proceed either to, that road or west onto 26, wasn’t a widening 217 per se, to expand the capacity of that highway. The big radius’s at that intersection just replaced a ‘T’ intersection that couldn’t enable traffic to keep flowing from 217. The radius’s helped some, but on a typical commute day traffic still backs up as people departing from 217 and proceeding to 26 westbound, meet a capacity traffic situation on 26, where rush hour stop and go is common, to 185th. Can’t remember for sure what the most recent year was that this routine daily congestion on those highways wasn’t an occurrence. Just a guess…maybe year 2000. Freeway widening as an effective means of successfully meeting the travel needs of the anticipated growing population in this area, just isn’t cutting it. Freeway widening is like a wonderful pipe dream…it’s big project jobs…people like that…but it’s very doubtful that such widening really can meet the travel needs of the area that people hope it will. These big, wide freeways become big, ugly and during rush hour…stagnant scars on the landscape. Both the north and south ends were rebuilt with the plan that 217 was going to eventually be three lane in each direction. The north end was widened as part of the MAX project. That’s why you see three lanes as you leave 26 and get on 217 all the way down to Canyon Road. The south end was done when the fly over ramp was added. As long as the engineers and corrupt highway builders don’t go crazy, the only overpass the needs to be replaced is the Hall Blvd. The reason it’s a billion dollar project is because the state wants to replace each and every overpass. Ridiculous. Yes, but every new overpass is a potential photo-op for Kate Brown. The increase in truck traffic resulting from the significant reduction in shipping from the Port is often overlooked as a contributing factor that should be a priority of the Governor and others. Did I just stumble into a Bond movie? No Mr. Bond, I expect you to RIDE. I think that guy was “Q”, not “q”. But I figure you weren’t referring to my name anyway, but to the fact that my comments are always so suave. Er… Yes. Suave. That was it. oops–meant as a reply to Hello Kitty’s “other q” comment above. I wonder if you would see a statement like this from Trimet if they were governed by a group of people who actually use the service rather than people who generally choose to drive even though they are provided with a free pass to use Trimet. We desperately need leadership from Trimet to create a service that is viewed not as a charity but as a legitimate form of transportation, and unfortunately at this point I think we have an appointed board who views it as a charity. I am sure they mean well, but the service that is being provided is closer to a soup kitchen than a restaurant people would go out of their way to eat at. Thinking about this more during a quick lunch ride gets me even more upset. 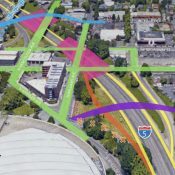 Why do we have countless meetings and process and debate about spending a pittance on simple, basic things like safer crossings and protected bike lanes to help save people’s lives —yet ODOT/TriMet/PBA/Port of Portland can meet behind closed doors and put together $500 million project as if it’s a foregone conclusion. Why would we spend $500 million on a central Portland freeway that works relatively well when we have n’hoods in east Portland where people die and are injured at an alarming rate? And others are so afraid of the streets they’re essentially held hostage by them. Where’s the debate about these freeway projects? How can get this far along on the I-5/Weidler thing without a real debate or a vote at City Council? I have a hunch that if this came to council there would be a robust response from all the Portlanders who care about the environment, transportation reform, public health, oil dependency, and so on and so forth (oh wait, maybe that’s why it hasn’t come to council — they’re clearly afraid of the pushback). Great summation of the whole thing. I wonder if some of it is thinking that adding a lane adds capacity–x vehicles per hour–but bike and pedestrian improvements just add convenience for recreational transport, vs. any quantifiable improvement to “real” transportation. The same can be said of some light rail and streetcar proposals. One of the most compelling testimonies against the Lake Oswego streetcar was from a woman asking the LO city council why they were even considering spending several hundred million for a streetcar that hardly anyone wanted, and nobody needed, while at the same time proposing closing her kids’ elementary school for want of a tiny fraction of that amount. Corruption and power grabs by those who wish to remain in power. Highway building funded by government subsidies makes them rich, but there’s no money to be made in saving lives (unless you count the health care racket, but safer streets take away their business). The rich lobbyists and oil bigwigs get to pad their massive wealth, while the rest of us get to fight over scraps, having our wealth quietly siphoned off up to the top. Thus is our neoliberal reality, but it doesn’t have to be this way. It’s all a conspiracy by the rich to keep the common man down. more like a war…and one the rich have been winning for generations. For all of human history, really. That said, our poorest are far, far better off than they’ve ever been (discounting comparatively tiny movements of the needle). In 2012 this project was a vague notion and council was voting on moving an idea forward. It was all very under the radar. Now it’s much more real and they’re putting real money on the table. Are you saying there has been a robust discussion about the merits of this specific project at council? A discussion that includes informed members of the community who are not employed by the city/state? It seems more like planning how to bring money to their respective agencies rather than transportation planning. Administrators within the institutions are promoted/ recruited for their skills of obtaining and allocating funds rather than carrying out the mission of the institution. …Much like when “environmentally-minded” democrats were supporting the CRC. In 1798 Thomas Robert Malthus famously predicted that short-term gains in living standards would inevitably be undermined as human population growth outstripped food production, and thereby drive living standards back toward subsistence. (shamelessly cribbed from ScientificAmerican). Point is no matter what you do, folks will continue to overpopulate, over-consume, etc. Build a new freeway and in no time it becomes over capacity. So why bother? Don’t build and folks will be forced to make decisions over choices. Live here, work there? Deal with it. Our desire to make responsible choices only encourages irresponsibility. My goodness, tax collections, welfare payments and education are the only relevant indicators of economic health? It’s so simple! And everyone knows that a random google street view photo is the only way to measure traffic congestion. You ought to be ashamed of yourself, Michael. You’re better than this. Trimet, the Democrats, the Republicans, they are all in the pocket of the freeway lobby. If people are serious about climate change, pollution, livability, stopping government waste etc., they need a plan to go directly to the people with a ballot measure/referral to stop the freeway madness. Getting people statewide to veto a tax increase for a polluting mega pork project in Portland would be an easy sell. The problem is the public at large likes highways. If they like them so much, why are they always complaining about being stuck in traffic on them? They think they should be wider to accommodate the other drivers. The point being, the voters in Portland have not always voted to support transit when given the chance. 3. If McFarlane thinks Portland needs him as a spokesman for the freeway lobby, perhaps he shouldn’t be working for a transit agency. There’s more to work than your commute. Or at least there should be! We’re all just so happy to be here! Cuz of the rainbows ‘n’ unicorns ‘n’ things. And, apparently, the midday nap recliners? I205 was supposed to be freight and overflow highway. It then morphed into the suburb highway and birthed Happy valley and countless other suburb sucking developments. See the pattern? I say, turn i5 into into a surface street like Greeley. And widen i205 to 20 lanes….Right through Clackamas. I’ve never liked driving — so when I last moved, I made sure I lived close to good TriMet service. Now, Monday through Friday, I rely on TriMet 100%. Hmmm….Well so you don’t love driving but yet…You are advocating for more driving? Its all about planning for 2035 or 2040, not for today. The expected growth for near urban areas in the Pac-NW over the next 10-20 years is astounding. City/Regional planners see $$$ in potential revenue for their respective areas. Property taxes, income taxes, business taxes, tolls, etc… Today’s metrics are not what is driving the lobbying (pun intended). By demonstrating the transportation system is trying to reduce congestion is a way to attract more people to live here. Unfortunately… the premise the planners are using is that people will continue to use vehicles at the same rate they are today. There is not much they can do to defend less vehicle trips in the future based on current models. All the traffic models show major growth the current roads cannot handle. This doesn’t mean I necessarily agree with lobbying for more/bigger roads. The ODOT-Trimet plan for 2040 is to turn Portland into a parking lot/ thoroughfare for the suburbs. If something can’t continue indefinitely, it won’t. What if we all lived 1-2 miles in proximity to where we work? Sounds idealistic, I know. However, I am often in disbelief looking at all the vehicle traffic that migrates from the western burbs, Vancouver, and what not. If someone wants to drive from Vancouver to Portland everyday, and enjoy the tax benefits and cost of living that results from living there, then suffer the commute. I was in South Florida, where my parents live, and their freeways and main thoroughfares are monstrosities several lanes wide. Traffic there is still daunting for those who use the roads there. Likewise, I do not think that expanding capacity is necessarily the answer. Again, that begs the question: what if we lived closer to where we work? Not only would we reduce traffic, but have more cohesive communities. Just my thoughts. You must be single. It’s really tough for a husband and wife to both find work in the same area. Totally unrealistic for everyone to do this. Also, keep in mind that a lot of people live in Vancouver because Washington funds their schools way better than Oregon does. There’s a reason why so many families move up there and Portland has so many single/childless people. But his point is good. Giving people more opportunities to live closer to where they work is a great alternative to building freeway lanes. And it doesn’t have to work for everyone, just some. We should look at WHY families are living in Washington instead of Portland, and do something about that. Again, we don’t need all families to stay here, just some. And we need to look at getting more jobs located closer to where the Washington families live. For decades, planning, zoning and transportation policy all focused on separating where people lived from where they worked. That separation wasn’t true historically, and it’s not true in many older cities. Some real effort should be focused on reversing those policies. It can’t help that all the beautiful new apartment buildings we’re constructing are best suited for unattached single people, and we’re busy converting any vaguely affordable family housing into something no one can afford (and the city will soon be adding incentives to accelerate that process). Yes, and the skewed policies are continuing even today. The new Residential Infill regulations that Portland is pushing forward (among several good things they do) also include several new regulations that give incentives to build small units, and penalize building larger units that would house families or extended families. Those same policies will encourage more rapid destruction of affordable housing. Maybe we’ll be replacing $350K houses with $750K duplexes rather than $1M houses, but it’s not really moving us in the right direction. RIP does have some good stuff, but it’s main thrust is potentially quite destructive if you value family housing and economic diversity. Our incentive structure should encourage preservation of affordable family housing. It also doesn’t help that since we’ve hollowed out a lot of neighborhood schools under the “school choice” regime of the last 20 years, a lot of parents find themselves sending their kids to schools outside their neighborhood where busing isn’t always a workable option. This is one of the big reasons you have so many kids being driven to school now, and people driving so many more miles (and creating more congestion) than they used to. You often have both parents working miles away from their home AND driving their kids to school also miles away from their home. It’s a mess, and one of the reasons those of us who’ve seen “Where to Invade Next” envy Finland’s system of EVERY neighborhood school being a good and humane place to educate their child, and almost all kids going to their neighborhood schools. No magnet schools, none of this two-tiered crap like most urban school systems where some schools are so much more desirable than other schools. The impact of the “school choice” movement on transportation is almost incalculable, and rarely reported on. David, are you in favor of better public transportation options for families like yours, unlike the other suburbs that have opposed light rail. Would you like the families that live in Portland to give up space for more roads, air quality for more traffic, bike lanes and traffic calming on safe streets so that your family can enjoy Washington and decrease your commute time by 1-5 minutes? It is for this reason, as well as the sense of community you have when your neighbor’s kids to to school with yours, that I am a strong proponent of local schools. I have some friends whose kids go to school all over the place (one in NE, another in SW, etc. ), and I think that’s just insane. The reality is that Oregon’s schools are woefully underfunded, and the presence of parents/volunteers has a big impact on what a school can do. Some neighborhoods are more able than others to provide this pool of unpaid labor, and are better able to raise funds for things the system really should be providing. This leads to some schools being more attractive than others, which feeds the whole concept of school choice. On the other hand, if you set the right tone at home, a kid can do quite well in even a mediocre school. Unfortunately, some parents are either unwilling or unable to do this, and their kids suffer disproportionately. SD – I am support of transit. 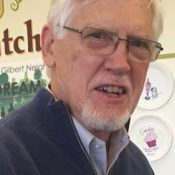 I supported the Tigard vote for light rail even though I thin the plan is a joke. I’d rather see it built right with a tunnel under OHSU and a better connection to PCC. But I would prefer to see the Red Line extended to Tigard and Tualatin. It would be cheaper and the transit time from Tigard to Portland would be about the same as it would be for the Barbur line. I also supported the LO streetcar. And I also support additional bus service. There should be service down the main roads in the suburbs with better bus stations. BRT is an opportunity if it’s built right. The Division/Powell line is looking more and more like a boon-dongle. Having said all this, roads and freeways are still an important characteristic of our transportation infrastructure. They are a necessary evil. Adding another lane to 217 isn’t going to solve the whole transportation problem. But the freeway isn’t going anywhere. There are few alternatives because of decades of poor infrastructure planning that can’t be fixed. And I’d love to see smart transit added to the mix. I’d love to see more transit oriented communities. Years ago there was a plan to make the area around Washington Square more urban with tall buildings. I’d love to see that happen more in the suburbs instead of the single level office parks surrounded by acres of parking. It’s been proven that people will get out of their cars if there are viable alternatives. Yes to all you said. And the whole project focuses on number of units, not how many people will live in them. So in the project’s eyes, a lot that has two one-bedroom units, probably housing a total of 4 adults (but maybe only 2, and certainly zero children) is better than a lot with a house with three or four bedrooms, which could house 5 or more people. And in the case of building say, 3 or 4 bedrooms on one lot, the project that divides them into two structures (a main house and a separate backyard ADU) is given incentives over on that puts them all in one structure. Obviously the family with kids isn’t going to be able to put one or two kids in a separate building. My “yes to all you said” was aimed at Hello Kitty. Hell yeah I am single. I live in a house with a married couple though, so it’s not far-fetched for married people to live in Portland, and commute to their jobs/PSU. Granted, I think you are correct that a couple is not always going to find meaningful, good paying work close by where they live. Yeah, I think it’s a pipe dream to assume so. Still, the notion should get people thinking about how they do life. My mom commuted 45-60 minutes (each way) to work from Stone Mountain, GA to Marietta, GA back in the 80s. She was not about to uproot her family to make her commute shorter (after all, I think she liked listening to all her positive thinking tapes in the car), so I am not that divorced from reality of people’s situations. Still, I wonder if 45-60 minute commutes are sustainable in the bigger picture. I say hell no! I’m going to suggest this might be easier in a town than a big (or medium sized) city. Wow, Neil M is not so bright. I think his time leading TM is short. All these old baby boomers are proving to be more a roadblock to progress than republicans in this state. Get out of the way if you don’t want the radical change we need. I don’t agree with the underlying mindset that improving freeways undermines the goal of improving bikeways. They’re not mutually exclusive. The applicable federal, state, and city agencies should focus on improving safety and efficiency for both. It’s a legitimate concern for Tri-Met as its buses sit in rush hour(s) traffic with the other 90+% of commuting Portlanders. I feel fortunate to bike commute and avoid that daily slog, but I’m not blind to the fact that it’s impractical for most folks – especially families with kids who can’t afford to live close-in. (That reality will only get worse.) I’m not suggesting the interstates should balloon to 10 lanes, but they should be widened with better, more efficient interchanges. I would also love to see more light rail lines, better bike routes, more greenways, and improved crosswalks for those run/walk commuters. All are valid. I’d maybe agree with you, if we lived in a state with copious fiscal capacity and willingness to fund all types of transportation, and cars didn’t produce noxious local air pollution and global greenhouse gases. However, we don’t live in such a state (I don’t think there are any in the U.S.) and driving does have huge, unpaid-for, negative effects on others. In the actual world that we live in, I’m going to fight using our scarce resources for further freeway expansion as hard as I reasonably can. I agree with Alex (as usual) but I’d add that I very much agree with Rob and others that it is unjust to oppose expansion of auto capacity in a growing city if we do not simultaneously increase the housing capacity (including the low-rent housing capacity) of land near jobs and schools. Yes, it is most definitely a privilege to be able to bike to one’s destinations easily, just as it is a privilege to be able to afford a car and/or a bedroom for each of one’s kids. This is why it’s so essential for biking, walking and transit advocates to also be advocates for more and cheaper housing in bikeable, walkable, transit-rich areas. The great example for U.S. urbanism, IMO, is the European or Asian city that has no urban freeways and much less driving per person. These cities prove every damn day that we can get dramatically less carbon-intensive and more economically mobile and still live happy healthy lives with lots of good food and cool stuff. But the single greatest difference between these cities and cities like Portland is not the street design or the amount of rail transit. It’s the fact that virtually all the housing for several miles outside of downtown is attached. This is the essential change that makes their transportation systems possible. Happily, this is exactly what’s been happening to Portland, Seattle, DC and Denver … all growing cities with strong anti-sprawl laws and decent to good transit systems. For the last few years they’ve begun filling in pretty nicely with multi-story housing. We are living the dream of the 70s. Now we just need to keep it going until these new buildings are old enough to be cheap. As it happens, I agree with Alex as well. And I agree with you that we need more affordable housing options throughout the city. Where we disagree is that I think the policies you vociferously advocate for will lead directly to more expensive, if denser, housing, with fewer opportunities for families to live in the inner city. That would be a great loss. Lots of great conversation; I have scattered thoughts but the thread is that we would like to change the need for the roads and not the roads. I agree. 1. Has anyone mentioned the changes to freight on our roads due to the loss of freight by ship at the Port of Portland? I haven’t researched the numbers lately. 2. Housing costs have pushed folks further out. That’s a fact, though I don’t know the numbers. 3. The tualatin mountain has very few ways across whether surface streets or highway. With such a divided population moving further West due to housing costs and perhaps fleeing PPS even surface streets are overwhelmed with cars now. With major employers growing outside of downtown, the ability to live in Portland as many of us used to is gone I’m afraid. 4. I agree that the density downtown has left families in a lurch. We have wanted to move downtown once our kids hit middle/high school but we would never afford it now. 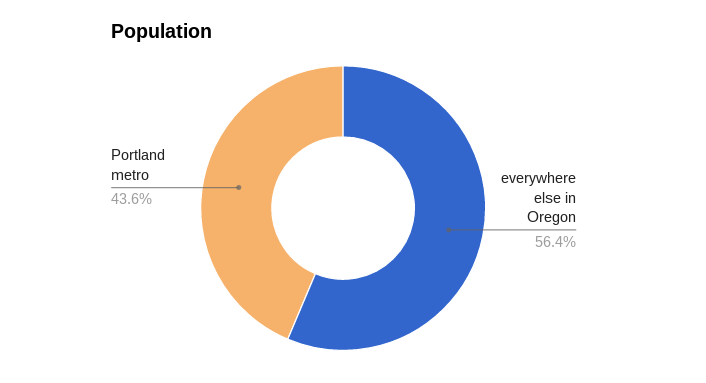 The interaction with where people are choosing for kids to go to school is a very important part of all the traffic, in addition to where they work. 5. Also, our culture of kid activities is problematic. Competitive sports teams, over involvement and the push for all activities to meet a lot to excel, to compete with others far away…these are our enemies at our house currently. As this is a wonderful bike forum, few of the above issues are completely solved with biking unfortunately. I’d suggest strong public schools (aside: why is our airport so amazing and well funded but our schools aren’t?? ), support for living strucutres for families downtown and sane school activity culture as a large part of a solution. Biking would be much more viable in that world. Last, I agree with Elon Musk that in the future…the solution is underground. I think Tesla does hyperloop tunnels for freight first, renewably powered. Portland is one of the last large cities that has largely bucked the trend of expanding mobile car storage and car storage in general. If they fall to the demands of the vehicle lobby, everything falls. Interesting conversation. The problem with MAX not having its own right of way and running on surface streets is it’s basically just a fancy, expensive bus on tracks and tied to power lines. It’s ridiculous that both I 5 and 405 are two lanes each direction through the city center. It’s not really feasible to widen them, but something needs to be done. I-5 in NOPO is 2 lanes + the HOV lane. Many of the commuters are from Vancouver and they refuse to pay for anything. If I’m going downtown I take TriMet, but anywhere else it’s just not feasible. I can drive to OHSU in 20 to 40(if there’s traffic) or I can take an hour to hour and a half on bus. Another problem with MAX is it takes forever to get through downtown because it stops every 2 blocks. Isn’t Orange line ridership below what they expected? Before we cause more congestion by taking lanes of traffic away from cars for MAX or bus that people MIGHT ride we should widen I5, 405, 84 or build alternate routes. Have you ever been to a city PDX’s size and seen its two main freeways only 2 lanes wide through the city center? It’s obvious the traffic engineers in PDX are crazy. I was shocked when they rebuilt the sell wood bridge and didn’t add any lanes for cars. They built a whole new bridge and it’s still one lane each way. That’s just silly. Why? Cars heading west are coming from one lane, and cars heading east are leaving the bridge onto one lane. The traffic jams aren’t on the bridge, they’re on the roads feeding it. So why spend tens of millions of dollars so cars can get jammed up on the bridge? Thank goodness we don’t let the public vote on road design. Those crazy engineers also designed the bridge to get slower bikes out of the vehicle lanes, so cars can go faster. And they made it safe for the first time for people walking and on bikes to use the bridge, meaning some people who would have had to drive over the old bridge aren’t adding to the vehicle traffic anymore.